In this self-portrait, Yi Wang wears a traditional Chinese silk gown embroidered with a dragon. The gown, the loose hair, the aged hand and the deep expression in his eyes behind the glasses suggest that he is telling an old oriental “long” story. For the background of the portrait, Wang uses a simple triangular ceiling to reflect the confusion in his heart between western and oriental art. He now feels that he is standing on the intersection. Born in Tianjin, China in 1959, Wang has a Bachelor of Art degree from the Tianjin Academy of Fine Arts. After graduating in 1982, he started work as a senior art editor for one of China’s biggest-selling newspapers, The Evening Gazette of Tianjin. In 1990, he set up the Shadow Art Gallery. His reputation as a portrait painter grew during the 1980s and he began receiving important commissions. 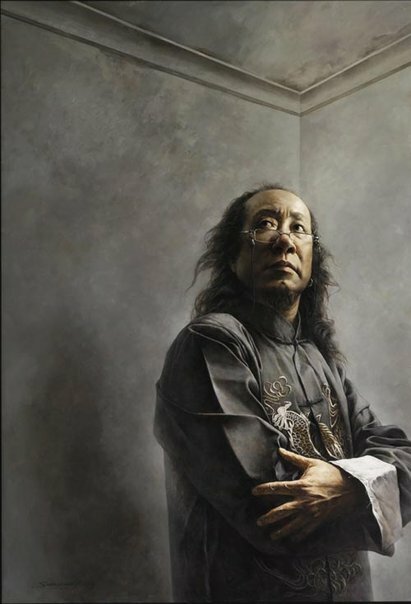 In 1987 an exhibition of his portraits called Liang Shan toured various Chinese cities. Some of these works are now in the collections of the Tianjin Gallery of Fine Art and the Bo Wen Gallery of Fine Art. Wang moved to Sydney in 2006. Since arriving here he has visited many art galleries and museums, which has exposed him to the great works of master artists across the centuries. As a result he has created a number of portrait oil paintings using very strict realistic techniques and a modern artistic aesthetic. This is his first time in the Archibald Prize.